This is the BEST Herbed Potato Salad. This is not your ordinary Mayonnaise-based Southern Potato Salad. There is absolutely no mayo, but instead a Julia-Child-esque Herbed Vinaigrette. It is absolutely delicious and can be served warm, cold or even at room temperature (best!) This is our absolute favorite side dish for a BBQ or summer fare. Enjoy! 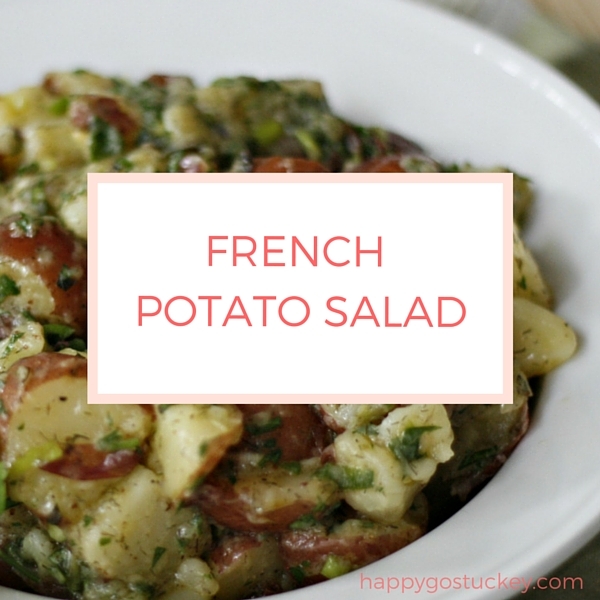 This Herbed Potato Salad is best served warm or at room temperature. Drop the white and red potatoes into a large pot of boiling, salted water and cook for 20-30 minutes, until they are just cooked through. Drain in a colander and place a kitchen towel over the potatoes to allow them to steam for 10 minutes. As soon as you can handle them, cut in half (quarters if the potatoes are larger) and place in a medium bowl. Toss gently with the wine and chicken stock. Allow the liquids to soak into the warm potatoes before proceeding. Combine the vinegar, mustard, ½ teaspoon salt, and ¼ teaspoon pepper and slowly whisk in the olive oil to make an emulsion. Add the scallion, dill, parsley, basil, salt to taste (the original recipe says to add the remaining 1 2/ tsp. but I always find that to be a bit much,) and ½ teaspoon pepper and toss. So glad you posted this!!! I was going to call you to ask for it… Again! Not sure why I didn’t make a copy the first time.